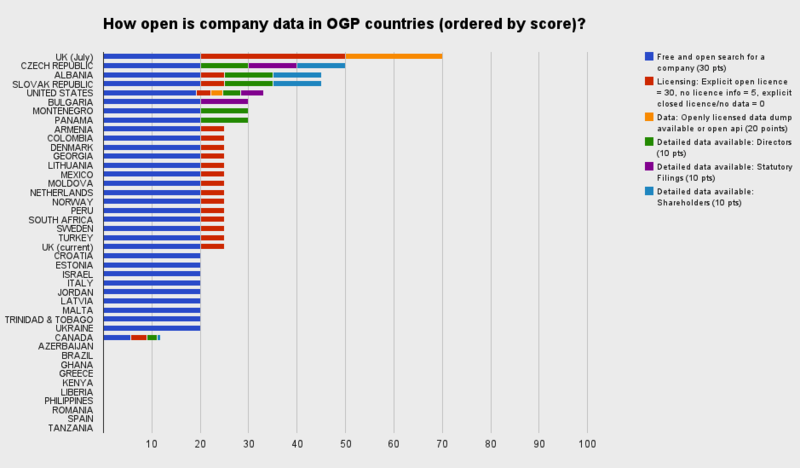 How open is company data in Open Government Partnership countries? Today, the day before the Open Government Partnership meeting starts in Brasilia, OpenCorporates is publishing a major new report into access to company data in OGP countries, and the picture is not good. Out of a total of a possible 100 points, the average score was just 21, with several major countries (including Spain, Greece and Brazil) scoring zero. A score of 100 means that the company register is an open data register, making detailed information free for reuse under an open licence, and also makes the information available as open data. A score of zero means the central register can not even be search without payment or registration. Highest score is the Czech Republic, with a score of 50, though the UK will achieve a score of 70 when it starts publishing a limited set of data under an open licence in July.